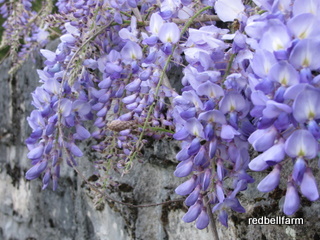 If you were a reader of 'Musings From Red Bell Farm,' you already know that I'm a fan of wisteria. I used a photo that I took in Provence for the banner of that blog. This is a photo I took of Laury's wisteria that is growing along the wall of her front yard. I managed to get it on my blog template as a custom background, but I'm not able to get it to fill the entire space, thus the 'tile' effect. I played around with the link colors as well. I'm not sure this is the final product; I'm going to live with awhile and see how I like it. Any thoughts? Evelyn, for some reason I no longer have your direct email address. Send it to me and I can forward you really simple directions a friend of mine gave me so you can use that photo for your background. It should allow it to have a seamless look. I love wisteria ... I just wish it had a longer life here.